We currently have the two radiation guys living on our floor at work, and one of them turned 60 on the weekend. My Divisions are very cake-oriented and we felt it would be terrible – terrible! – if someone living on the same floor as us did not get birthday cake. But how could he get birthday cake with no lab to bake for him? This cake looks like a completely insane – and enormous – chocolate cake, and certainly, the fact that it has about a kilo of chocolate on top of it does make it hard to argue that it isn’t chocolatey. But don’t be fooled – the inside is a moist butter cake packed with almond meal, raspberries, blueberries and blackberries. It’s based on a Women’s Weekly recipe which I have naturally altered beyond recognition. 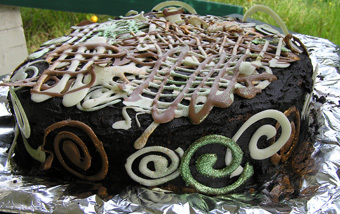 The cake itself is enormous – I used a 30 cm round tin which is about 10cm deep. The cake filled it to the brim. I was aiming to feed 70-odd people, and I succeeded. 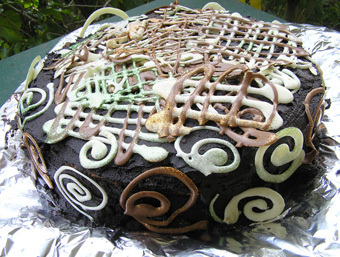 The decorations were not entirely successful, largely because I was too tired to think, but the actual method for decorating this cake is pretty easy and looks very spectacular – instructions are at the end of the recipe. Preheat the oven to 165°C, and grease and line a deep 30 cm round tin (or a 25 cm round tin plus a 17 cm round tin). In your biggest bowl (really!) Beat together butter and sugar until fluffy (for this cake, I use electric beaters), then beat in the eggs one by one, which takes ages. Sorry. It might curdle a little, but don’t let that bother you. The flour will bring it together. Using a flexible spatula if you have one, stir in the sour cream, then the almond meal and flours, then finally (and gently) the berries. Scrape everything into the prepared tin, and bake for what seems like years but is actually only about three hours – you want the cake to feel cooked in the centre when you press on it, and you may need to turn the oven down partway through to prevent the cake burning. Let cool overnight in the tin, which will also resolve any questions over whether the cake was really truly cooked through or whether you just got impatient and wanted to go to bed already. Turn out onto a plate, and decorate with ganache and chocolate squiggles, flowers, stars, etc. 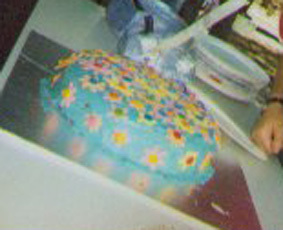 Basically, you get the ganache over the cake, and then pile your decorations up a bit for a 3D effect. If you are smart and made the chocolate quite thick, you can have them really standing up and popping out of the cake. I didn’t manage that this time. Melt your white and milk chocolate separately and pour into piping bags. Incidentally, it’s much easier to get anything into a piping bag if you fold back the top couple of inches of the bag over your hand so you can hold the bag open without ending up covered with chocolate. Let the chocolate cool a bit in the bag until it is a little thick, then cut a small hole in the piping bag. Pipe spirals or swirls or flowers or stars or crosshatches or squiggles whatever you like onto baking paper and let set in the fridge or freezer. You can sift edible glitter over these while they are still soft, but whatever you do, don’t face-paint with the glitter. People were coming up to me all day saying “Ooh, you’re glittery!”. And there is glitter on my bed, my towels, my face, my top, and the cat. But I digress. Actually, another digression worth noting: first, you can get edible glitter at specialist cake decorating stores (Cake Deco is my usual source), but not at supermarkets. Secondly, it really will get into everything even if you don’t chase your husband around the kitchen with it threatening to put glitter in his hair. I used it on my brother’s wedding cake, and behaved entirely sensibly the whole time I was using it, and we were still sweeping glitter off floors, washing glitter pillowcases and fishing glitter out of the dishwasher filter three weeks later. Don’t say I didn’t warn you. Aside from the colour? Well, you aren’t going to make this cake without eggs, I’m afraid, so you should probably resign yourself to making something else if you want to go egg-free. You could replace almond meal with any other ground nuts, or for more plain flour if you need to avoid nuts entirely- you’d get a less moist cake that would be more like a standard butter cake, I’d think. I think dairy-free margarine would work to replace the butter, but it seems rather a pity to do so in such a buttery cake. It might be fun to go half margarine and half coconut butter, cocoa butter, or even a nut butter. My suspicion is that this one wouldn’t work very well gluten free unless you had a really good gluten-free flour. You might add in an extra cup of almond meal, and then have two cups of gluten-free cake flour and a tablespoon of baking powder, but I’m honestly not 100% sure that this would work. Oh, and you don’t have to cover it with ganache – it would be lovely with a raspberry buttercream, or a chocolate one, or one made with a nut butter (a Gianduja buttercream would be amazing, especially if you used hazelnut meal in the cake). You could probably just dust it with icing sugar, too, but if you are making a cake this size, I feel you should go for decadence. And maximise the glitter. Probably the most useful variation here is halving the recipe. A half quantity of this would fit in a 20-21cm round cake tin, and would bake in a bit over an hour – I’d check it at the one hour mark and expect it to take about an hour and fifteen minutes, and I’d bake it at 170°C. Phwoar!! Any chance my workplace could poach you? A kilo of chocolate! I think you’d have a fight on your hands. My scientists take their cake pretty seriously. We even have a weekly cake club, just to make sure that there are no weeks without cake in them, regardless of birthdays.